I may be simplifying things a little, but for Valentine’s Day I like to make sure that red, pink and orange are featured prominently on my menu. Other people have other theories, but for me it’s the hit of rich ruby hues that makes my table feel love-filled. This Valentine’s Day I’m featuring warm beet salad as a starter with candy cane beets, blood oranges, and sun-dried tomatoes. This will a little bubbly to start off the meal. For the main I’m going to serve risotto rosso (definitely one of my favs), with mushroom parcels on the side and some beans almandine. Since those sharing my Valentine’s Day table – who I love most – aren’t vegan, there will be a filet mignon to satisfy their inner carnivore. Dessert? Very simply, dark chocolate, pecans, and pears. I’m working on my thanksgiving menu. I’ll roast a chicken for the kids – they don’t like turkey but do have a strangely spiritual relationship with my roast chicken that must reach back through the generations as it’s their number one comfort food. But for the vegans at the table? Everything else will be drawn from v:gourmet and will be an offering to the powers that be for the beauty, complexity, healing power, and pleasure of vegetables and grains. On the menu? Well for a little pre-dinner nibble, I think we have to have the veggie pâté. It’s my new favourite and it kind of tastes like stuffing so you get that amazing when-I-was-a-kid-at-my-grandma’s-kind-of-taste spread on an crunchy homemade crostini. You can’t go wrong. 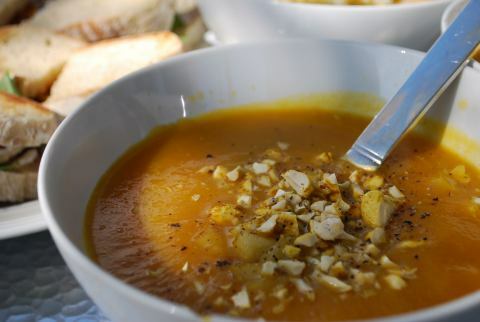 For an appetizer I think we’ll raise a toast over spicy pumpkin and fennel soup with carmelized apples. The main coarse will boast portobello mushrooms with cashews and herbs, roasted brussels spouts with shallots and shitake, simple cauliflower, and a parsnip celery root puree with cardamom and vanilla bean. And if I’m really feeling inspired on the day I might also whip up some onion confit just because – if there is one thing I should give thanks for – it’s onions. Dessert? Not sure yet. It will likely include apples or some other fall fare. I’ll keep you posted if I’m not comatose from dinner. How can you not be thankful for a dinner like that?! Easter weekend is coming up for those who celebrate Easter. We are heading to our farm in Prince Edward County and I’d like to put together an interesting and seasonally appropriate feast. We need to use up what’s in the larder – the remaining winter vegetables and preserved fruits lovingly stored away last Fall – coupled with a shot of the first greens of spring which, depending on where you live, include spinach, arugula, sprouts, maybe some asparagus. Also, in looking for inspiration I discovered the oft-forgotten role of the pear at Easter. Did you know that there are several species of pear connected to this high holiday? Pyrus communis, or Easter Pear, which is a very unusual green, yellow and pink striped pear native to the Ukraine, and the Easter Beurre Pear which originated in a monastary in Louvain, Belgium in 1823. Both were traditionally stored through the winter and paraded as a table decoration before eating at Easter time to celebrate the onset of spring. And Pear Festivals abound like the Pear Tree Easter Carnival held at the Stone Store Basin in Kerikeri, New Zealand. So in anticipation of Easter Monday’s feast I give you a menu inspired by the Easter Pear that uses what’s still in the pantry from winter adorned with the first greens of spring. To get the salivary glands a-salavating and the taste buds a-tasting, start with a fresh argula salad with grilled asparagus and roasted pear and thyme dressing. To follow, wow your guests with a tower of winter vegetables with spring micro-greens and butternut squash and pear purée on the side. You could always sneak in a little Poire Williams as an amuse-bouche before knocking out your dinner companions with the unbelievably tasty baked pear with ginger and cinnamon. Happy Easter. May the coming of Spring renew your spirit and refresh your soul. 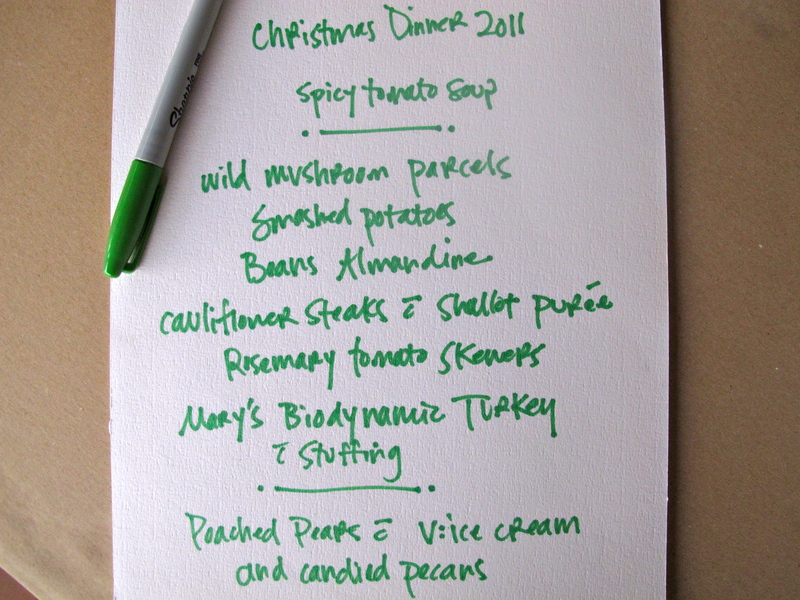 I’ve just finalized my Christmas menu and I have to say that I’m psyched. Vicki’s Veggies makes a mean spicy tomato soup that I think I’ll have as a starter ’cause that’s easy and it’s one thing I won’t have to worry about preparing. And it’s local and organic and supports small business so it’s all good. For the main course I’m going to fill everyone’s bellies to near-bursting with wild mushroom parcels, garlic smashed potatoes, beans almandine, cauliflower steaks with apple shallot purée, and rosemary tomato skewers. All vegan. And we’ll roast my sister’s biodynamic turkey from Quebec with traditional stuffing and maybe even gravy for all those at the table who like a little meat with their potatoes. 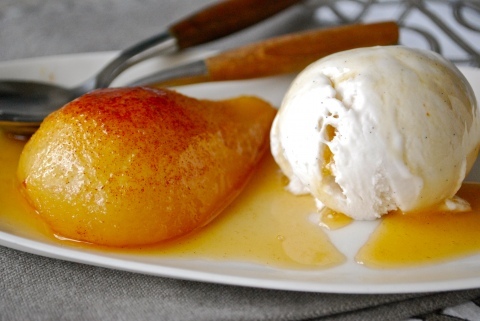 Dessert will feature poached pears with soy ice cream (So Delicious is a great brand) and candied pecans. Love the winter combo of fruit and nuts. To recover, we’ll then have to move outside and partake in a little digestif by the bonfire. And as Wendy Cope famously said, “Bloody Christmas, here again, let us raise a loving cup, peace on earth, goodwill to men, and make them do the washing up.” Amen. With January upon us I’ve heard a lot of murmurings about New Year’s resolutions and people wanting to live cleaner, be healthier, and cook better. A number of you v:gourmet followers have asked me for the top 10 easiest recipes for dinner to help you get into new routines and dig into v:eating more regularly. So I’ve combed the site for you for 10 simple yet varied recipes to give you a hand along the way. Keep these in your daily arsenal and you’ll never go hungry again. 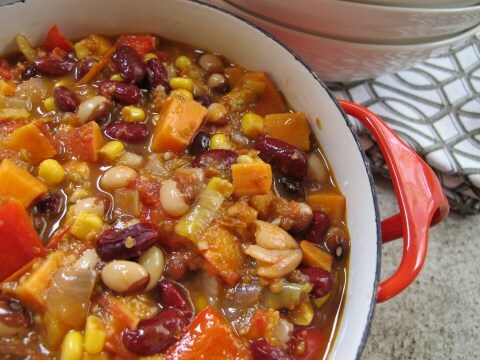 1. sweet potato chili Cook up this combination of beans, sweet potato, peppers, and corn and you’ll have a southwestern inspired meal in no time. Simply serve with rice and a salad and you’re good to go. You can soak your own beans or, to make this one of the simplest recipes around, use canned beans and be done with it. 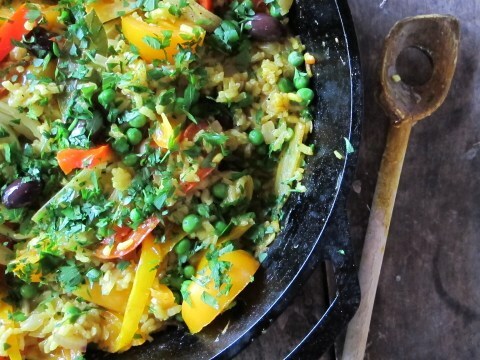 2. vegetable paella This is a one pan dish that you just build as you go along. There are a couple of steps but it’s no biggie. Start with onions. Add a few veggies. Spices. Then rice. Stock. Don’t even stir! (Gotta love that). Then toss on some tomatoes. Could it be any more staightforward? It calls for calaspara rice but if you can’t find it just use arborio or another fat short-grain rice. And don’t sweat it – even basmati will do the trick in a pinch. 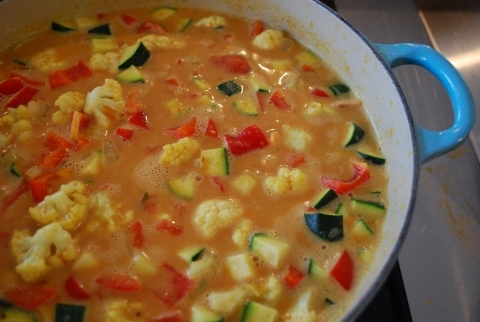 3. vegetables in thai red curry The first time I cooked this we were blown away by how quick and tasty it was. It’s now a recurring theme on our menu, particularly on those nights when you’re tired and uninspired. Whip up the curry sauce. Throw in your vegetables. Done and done. The recipe calls for some blanching but honestly, most nights I ignore that step and just throw it all together. 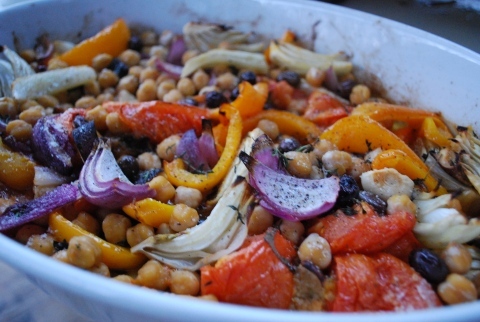 4. roasted veggies with chickpeas Hardly seems like a main you might say. But I beg to differ. Roast up these babies after some basic chopping and tossing with olive oil and you really don’t need much more to fill the belly and put a smile on your face. Especially if you add some lightly dressed greens and a good hunk of baguette or warmed up pita. Why complicate life when it can be so simple? 5. amazing maple beans The time required for this recipe is in the soaking and cooking of beans which I like to do. However, if you’ve got a can of beans or two in your cupboard and you want to cut corners, feel free. Life’s short. 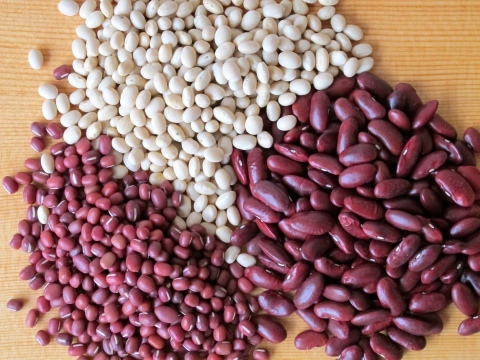 These beans are delicious – sweet, savoury, filling, nuturing, nutritious. They are good as a stew with some hearty bread on the side. Or as a substantial side to rice, some steamed broccoli, and a little BBQ pork for the kids. 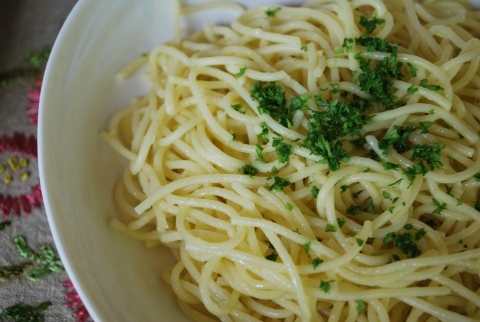 6. aglio olio If you want a fast and easy pasta in your repertoire, aglio olio is the dish for you. A traditional spaghetti recipe from Abruzzo, it elevates the essentials like good olive oil, garlic, and sea salt. I think the only accompaniment necessary is a bottle of Italian red and your dinner’s cooked. The hardest part might be finding those damn matches so you can light the candles. 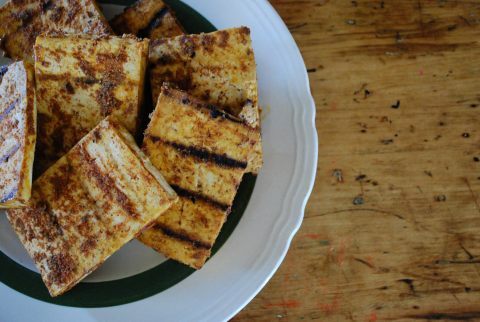 7. nice and spicy marinated tofu We just can’t get away from this recipe. Not a main course on its own but it’s so yummy that we often find ourselves throwing it on the BBQ alongside peppers, zucchini, and onions. Add a carb like potatoes and it’s almost my grandmother’s standard protein/veg/carb combo dinner. Well, except for the meat, cheese, and butter. God bless her. And God bless grilling. 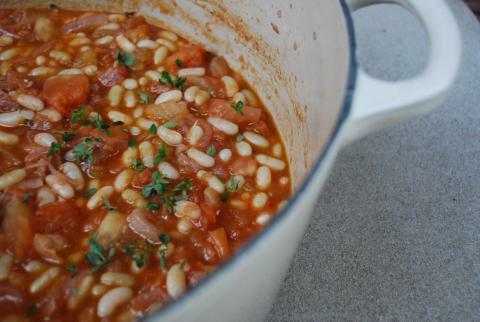 8. flageolet à la provençal So folks, for this recipe you’re going to have to soak the beans since I’ve never seen flageolet in a can. But you are welcome to use another little white bean like cannelli which you can find pre-cooked and ready to roll. With beans in hand, the rest is super simple. Just make sure to choose really good-quality ingredients like organic tomatoes and fresh basil. 9. smoky spicy split peas Super simple and really good when you’ve got a chill in the bone and need something that will stick to the ribs. I never liked split peas but with this new discovery I’m quite a fan. Buy some really good smoked Spanish paprika and the recipe will hum. I like this one with some steamed kale or chard on the side. 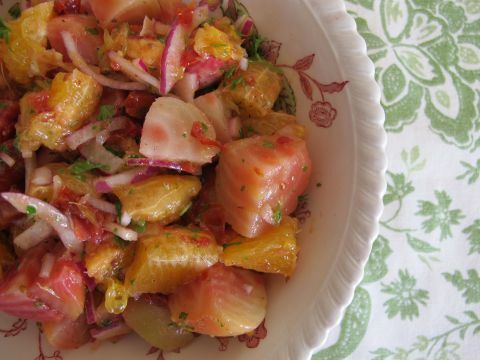 And maybe some pickled beets from the market. 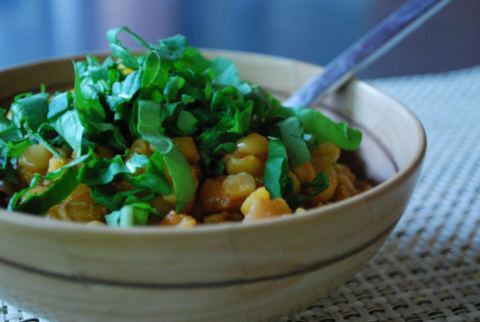 10. coconut curried vegetables This is an early v:gourmet recipe cooked regularly in our house because it’s so easy. And if you make a big vat of it, you can freeze it and have it around for those rushed nights when all you want to do is pull something out of the freezer, throw it on the stove, and veg out. Serve it in a bowl, sit, and eat. Or combine it with a grain to make it more substantial. Where did I read “The ability to simplify means to eliminate the unnecessary so that the necessary may speak”?